The euro soared on what is being described as hope for a Greek deal with the EU, but we see it as a good old fashioned short squeeze. We have been noting the massive short positions speculators had accumulated in the Euro. As you probably know, when traders overcrowd a market it tends to be a precursor to a violent reversal. Today we finally got it. In our estimation, there are likely plenty more shorts in the euro to keep the overall trend higher. In fact, euro speculators had been holding the largest net short position in history, so today's move could be only the beginning. With that said, it would be rare for the market to muster up momentum after a day like today, so some back and filling is in order. Tomorrow's ECB meeting was likely a primary catalyst for today's short squeeze. Further, it could be the source of more volatility so traders should be on their toes. We opted to sell Euro calls today against our short puts to get back into a relatively neutral trade. Ideally, if the ECB meeting is a non-event, we expect the option premiums to decline quickly (which would be favorable to our position). Bonds and notes suffered sharp losses for the second consecutive session following what was a successful week for the bulls. At this point, the chart has shifted from neutral to slightly bearish. We doubt another big flush is on the way, but we also doubt buyers will be willing to step in at these levels. 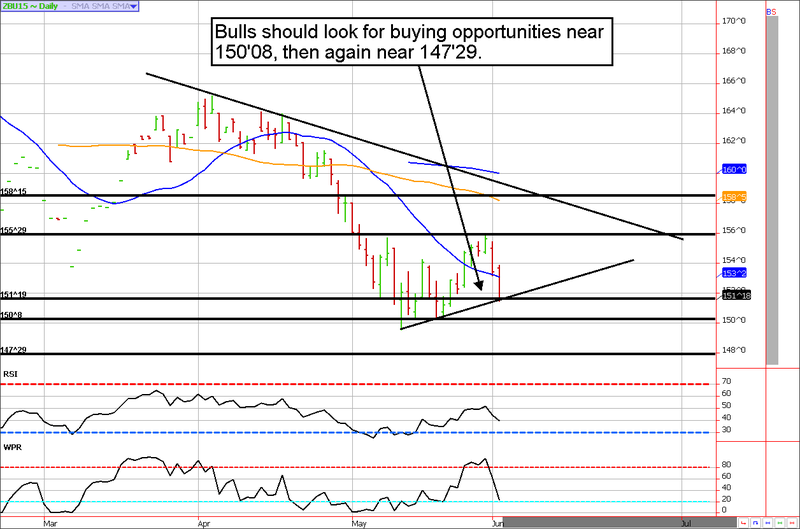 A more likely scenario would be a test of support levels, at which time the bulls might start to get interested. If you are trading the long bond (ZB), look for possible support near 150'08, and then again near 147'29 (which is a more conservative and reliable entry). 10-year note traders should be looking for 125'30, then 125'10. *You should be trading the September Treasuries now! **Consensus:** Treasuries are in consolidation mode. We'll likely see continued moderate weakness before buyers step back in. **Resistance:** ZB : 155'23, and 158'15 ZN: 128'08, and 129. The direction of the equity market from here will be largely dependent on upcoming news; namely tomorrow's ECB meeting and Friday's jobs report. 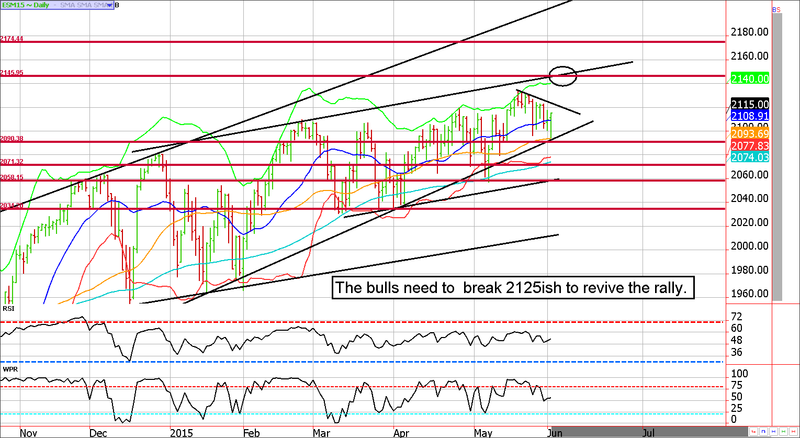 However, we like the prospects of a continuation of the rally in the S&P (at least to the trend-line of 2145ish). Today's low was near the up-trend channel support, suggesting the next move should be higher. We realize we've been saying this for weeks, and nothing has happened yet but sometimes that's how markets trade...When it comes to price action, it is either feast or famine. As we've also been stating, 2145 will be a potential reversal zone but if the move continues, 2170 will be the next level the bears can focus on. June is known as being a sluggish month, so we'll consider turning bearish at the noted levels. There certainly aren't a shortage of stock market bears out there, and they are getting louder as the market drifts higher but the reality is that markets rarely give traders this much time to build a position. In other words, market tops usually don't occur in a quiet market, instead it is more common to see a large price spike in the direction of the trend before rolling over. Perhaps we'll see a payroll report rally into resistance levels, if so it might be time to begin looking for a market correction. **Consensus:** We were expecting to see a test of the trend-line prior to the market rolling over; we suspect the bulls will still find a way to finish the job. We are looking for a run to 2144ish. April 1 - Buy a July soybean $11.10 call for 5 cents ($250). May 20 - Sell a July Euro strangle using the 116.50 call and the 105.50 put for about 70 ticks ($875). May 26 - Buy back July Euro 116.50 call near 12 ticks to lock in profit of $250 to $275 for most per contract, before transaction costs. June 2 - Sell July Euro 116 calls for about 28 ticks to re-strangle the market and collect more premium. This brings the position back to neutral.